Enter your email address to grab "The Power of Early Rising" PDF! Over the years, I’ve developed a system that is extremely powerful. This system was developed by studying the habits of the world’s most effective people. CEOs, Olympic athletes, martial artists, monks, and prolific artists and achievers from the past. In the book “Daily Rituals – How Artists Work”, the author, Mason Currey studies the lives of many of our most prolific artists, thinkers and achievers. From Mozart to Voltaire, from Beethoven to Hemingway, from Benjamin Franklin to Vincent Van Gough. Want to know what they all had in common? Rising early and doing their most important work first. Your energy is freshest in the morning, your willpower the highest, and don’t forget – Resistance sleeps in! You can get a jump on things in the morning, if you choose to create that time for yourself. This is why I have decided to release a brand new in-depth PDF from my Creative Mastery course that you can download for FREE! The systems detailed inside of this PDF help you wake up earlier by building better habits around the clock; not just in the morning. Taking a holistic perspective like this not only allows you to wake earlier and get more done, it’ll also improve your overall energy and health. Creative Mastery is a cutting edge online course that will powerfully transform the relationship between you and your music. It condenses and distills over 10 years of Vespers’ personal development experience, coaching, and research on peak performance into a 5 week action-packed course. 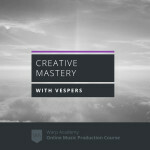 In Creative Mastery you’ll learn to powerfully finish what you start, tap into unlimited creative energy, and connect with the unique music that lies within you. You’ll uncover the secrets to be in a state of flow, increase your mental focus, and break free of frustration and pressure. You’ll walk away with techniques to “destuckify” yourself, avoid creative traps and roadblocks. Ultimately, you’ll feel more consistently fulfilled with your music.